An ice-cream-loving reader in Ghana recently wrote to us about a woman he saw in the streets selling homemade ice cream: “Honey ice cream – I think I tasted cinnamon or nutmeg, but it was very subtle. It was dense, too…might be worth playing around with coconut/soy/condensed milk. There was also something almost fruity to it….maybe orange peel?” I for one wasn’t surprised to hear about this enterprising woman, as cultures in hot climes have been refreshing themselves with frozen foods for millennia. 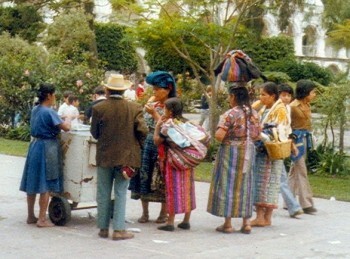 In fact, every culture wants to claim ice cream for its own. Arabic cultures claim the sharbat, which is traditionally a frozen water ice similar to a Sicilian granita but served as a drink. Indians have been making kulfi for untold centuries by cooking down milk and freezing it in porous earthenware. Marco Polo’s 13th-century journals record the Chinese emperor Kublai Khan as eating a kind of ice cream thickened with rice flour. Whether or not Marco ever actually made it to China is up for debate (and I tend to agree with the scholars who say he was just passing along stories he heard in Persia), but Chinese documents from the period do corroborate the existence of a rice-milk-based ice cream in China at the time. A chef by the name of Bernardo Buontalenti is credited with inventing ice cream by freezing sweetened cream for young Catherine de’ Medici. Some sources insist that he worked for her cousin, Marie, seven decades later. The confusion in generations may be due to the fact that Buontalenti almost certainly didn’t exist, which hasn’t stopped historians from often and authoritatively describing him as the inventor of ice cream. (The Buontalenti family itself, a very real Florentine family, has done little to discourage the story.) In any case, it’s very possible that it was one of the Medici women who carried ice cream to France; Catherine married the future Henry II in 1533 and Marie married Henry IV in 1600. My vote is for Catherine, famous for her voracious appetite, who took her (real) Italian chefs with her to Paris and single-handedly started a revolution in French cookery. She would never have left her ice cream behind. Much of today’s ice cream has little in common with the original stuff, which had no guar gum and cellulose gum, added nowadays to stop ice cream from dripping chocolate streaks down the front of your clean white shirt. These gums also hold air, which makes ice cream smoother and, not coincidentally, cheaper to manufacture. Unfortunately, they also make it possible for producers to make “ice cream” with no actual cream–an innovation that allows you to leave an ice cream sandwich on the dashboard of your car in the summer without it melting and making a mess. Quite an advantage, but not one that outweighs its inherent “yuck” factor. Of course, one of the joys of ice cream is the fun of its reinvention. Renaissance ice cream men may not have had to contend with lecithin and carrageenan, they also never knew the pleasures (and pains) of today’s gourmet gelati, replete with cookie dough, lemongrass, clams, crunchy candy chunks, saffron, chili pepper, or miniature chocolate cows. Michelangelo and the gang didn’t know what they were missing. 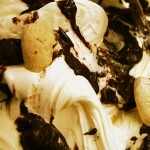 Check out our recipe for milk and honey gelato (perfect for Passover, or any other time of year). Like manna from heaven.